President arrives to console mourners, hears from bereaved father and widow who demand he recommend normalization of Havat Gilad. 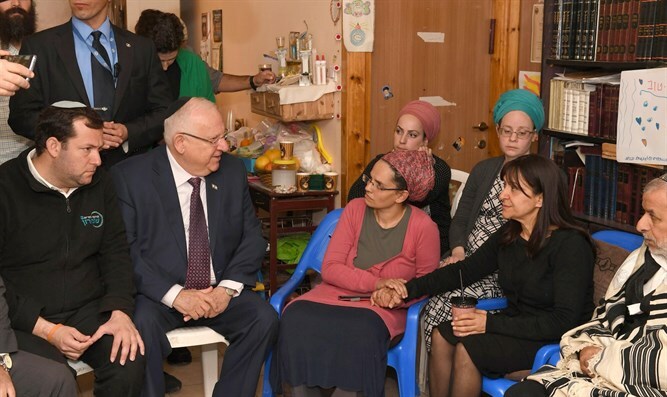 President Reuven Rivlin arrived this morning together with Samaria Regional Council head Yossi Dagan to offer condolences to the mourning Shevach family whose father, Rabbi Raziel Shevach, a 32-year-old father of six, was murdered in a shooting attack near Gilad Farm (Havat Gilad) in Samaria last week. During the meeting the widow Yael and the father of the murdered, Moshe Shevach, asked the President to act towards gaining Gilad Farm official status. Moshe Shevach, the father of the murdered rabbi, told the President: "We are not concerned with the security issue and we don't offer advice to the Defense Minister. We don't care about vengeance, we want revival. This place was bought by Moshe Zar. This is private property. They only have to make a decision. All the data is available. This won't cause any complications. There's no dispute about it. Can the President please recommend normalizing Havat Gilad? For the children. For the sake of the murdered. There's no reason not to do it. It's a matter of a mere decision by the Prime Minister. We ask the President to recommend it." "The State of Israel will ultimately have to decide the status of Havat Gilad within the Land of Israel," the President replied to the father. "Your words are very reasonable. There is logic here that requires consideration or at least attention. And ultimately decisions and a verdict must be made." President Rivlin added: "Here we are talking about a case similar to Nabi Samwil, where a settlement that is part of Jerusalem was established. We, in the form of peace and at the level of coexistence; and each one of you has acquired the land on a personal and national level. You made full purchase ... The Land of Israel was built with love. We cling to our land out of love for her." "The request of the widow and the family to recognize Havat Gilad, I say as the head of the Samaria Council, is a moral statement," Shomron Regional Council head Dagan told the President. "This wonderful family doesn't seek revenge and doesn't want to hurt anyone. The correct positive Zionist answer is to take the mourning to a positive place of building the Land. Therefore the issue of normalizing Havat Gilad is important to us."